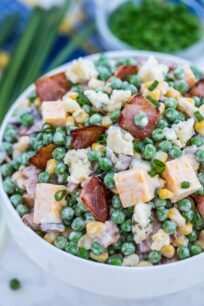 Pea Salad is a classic side dish with a sweet and savory taste that has a creamy and crunchy texture. It is perfect for getaways, potlucks, or parties, and ready in just ten minutes! This salad is refreshing just like the Creamy Grape Salad. It pairs well with other savory dishes like Chicken Katsu with Tonkatsu Sauce, Garlic Brown Sugar Lamb Ribs, and Instant Pot Barbecue Chicken. 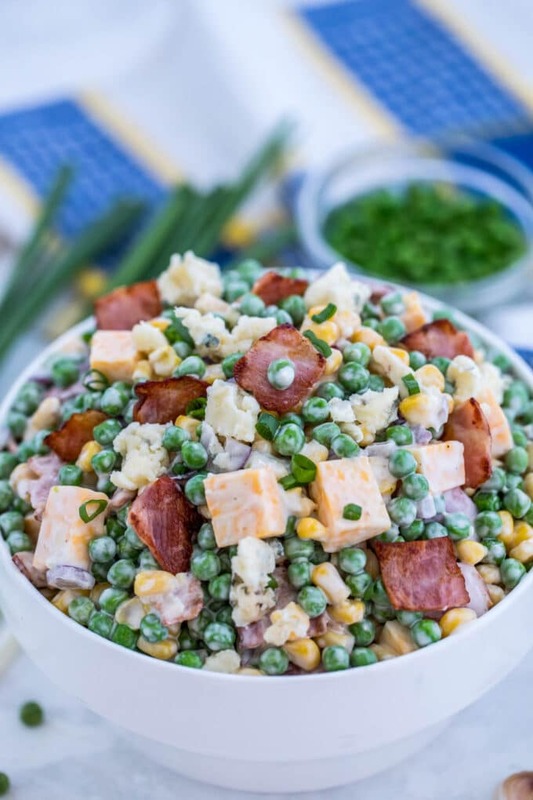 Pea salad is made of thawed frozen peas with a creamy and cheesy dressing and finished off with crispy bacon bits. With pre-cooked bacon bits, you can make this recipe in less than 5 minutes, as you just have to combine and mix the ingredients together. This is a great salad to enjoy during spring or summer time. The peas pop as you chew on them, and the bacon bits add crunchiness to it. Not to mention, bacon and cheese is a match made in heaven. The ingredients are also easy to find, which makes this dish satisfying, and budget-friendly to make. How to make sweet pea salad? Thaw frozen sweet peas and sweet corn. Put them in a sizable bowl. Mix in the onions, garlic, bacon bits, cheddar cheese, and about 2/3 of the blue cheese. In a separate bowl, combine the ingredients for the dressing: mayonnaise, sour cream, salt, and pepper. Add the dressing to the salad and toss. Refrigerate for about 2 to 4 hours to chill and to let all the flavors sit and absorb before serving. Garnish with remaining blue cheese, green onions, and bacon bits. Can you make pea salad in advance? Absolutely! Not only making it ahead is convenient, but it will even be tastier. Therefore, you can prepare in advance and store it in the refrigerator for up to 3 days in advance. Remember, to always chill this dish before serving, so allow additional 1 to 2 hours for this. How to make pea salad with eggs? Eggs go well with this dish, essentially, with the bacon and cheese. Just chop some hardboiled eggs and mix with the rest of the salad. To find out how to perfectly cook hard boiled eggs in the Instant Pot, click on this link. How to make English pea salad? To make an English pea salad, just follow the recipe mentioned above. 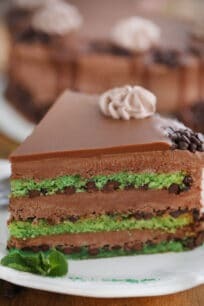 English pea is another term for sweet pea, which is the exact type of pea mentioned in this recipe. How to make pea salad with frozen peas? Using frozen peas in this recipe is the benchmark. Just thaw them out prior to making the salad. Then, drain the water prior to assembly. It might take some extra time to thaw them, so plan accordingly. Also, you could transfer the peas from the freezer to the refrigerator the night before, and have them ready in the morning. Another alternative would be to use canned ones. However, the texture might be different from what you are used to. Canned peas might be mushier so we always try to use fresh or thawed frozen ones. How many calories are there in a pea salad? The calories in this dish will vary based on ingredients and quantity used, and it can range somewhere in from 300 to 500 kcal. The main contributor for this is fat coming from the mayonnaise and cheese. To reduce the calories, you can use fat-free mayonnaise and less cheese. How to make pea salad with mayonnaise? The simplest pea salad recipe is to just combine peas, onion, hardboiled eggs, salt, pepper, and mayonnaise. Basically, you cannot leave out the mayonnaise. For a creamier salad, add more mayo. But, if you are watching your calorie intake, opt for a lighter, less-fat version of mayonnaise. 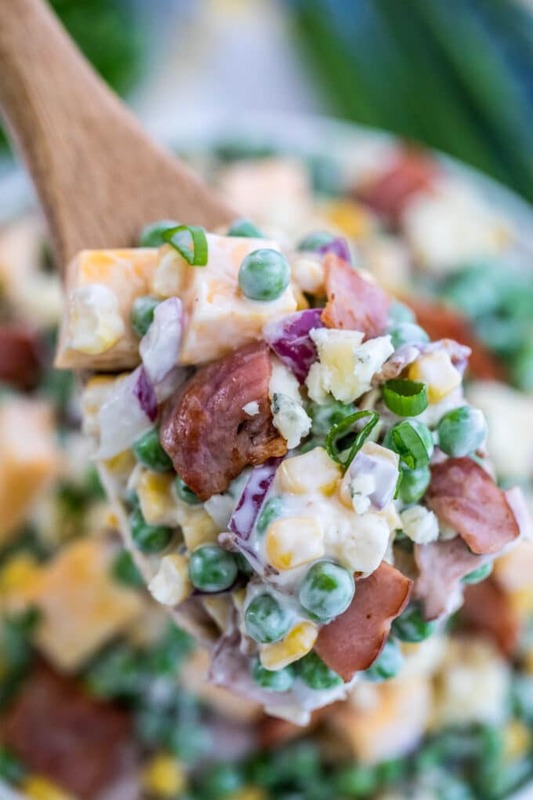 How to store bacon pea salad? You can simply put everything in an airtight container and store in the refrigerator for up to 3 days. If you run out of bacon bits, just cook some bacon until nice and crispy. Then, simply crush it and add to the mixture. Instead of sour cream, you may use vinegar or lemon juice to add some acid to the mix. This recipe is extremely versatile. So, you can add just about anything that suits your taste like chicken or ham, even bell peppers. Drain thawed sweet peas of excess water. Drain the sweet corn. Add to a large salad bowl. Add chopped onion, minced garlic, cooked bacon, diced cheddar cheese and 2/3 of the blue cheese. Mix dressing ingredients in a bowl until combined. Add to salad and toss to combine. Refrigerate for 2-4 hours before serving. Top with the remaining crumbled blue cheese, green onions, and more bacon bits. Store in the fridge for up to 3 days. Always serve chilled. I love peas and put them in a lot of my cooking. I love the idea of this salad and will make a versionn of it and keep the calories down. I always enjoy making and eating these types of salad. Your pea salad is perfect for spring and summer. I need to add it to my Easter menu. This looks wonderful and I look forward to some warm weather to try it. 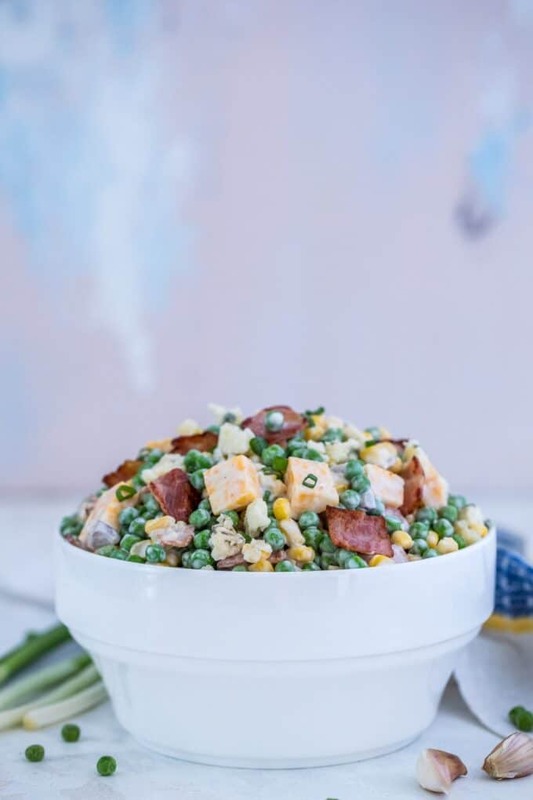 My usual pea salad recipe is thawed frozen peas, dill pickles, crispy bacon, and cheddar cheese chunks and a mayo dressing. At any rate, looking foward to this, thank you very much. This looks so amazing! I just love peas, so I’m pretty sure I’d enjoy this salad. It looks scrumptious. What a delicious sounding pea salad. I have to admit I don’t think I’ve ever made anything like it before, I’m such a bore when it comes to salads, I’ll have to try this. My cousin makes a great pea salad but doesn’t use bacon in it. This recipe sounds interesting. but I love my cousin’s version. I’ve never thought to make nor had pea salad, I enjoy eating them alone, so i’m going to have to try this! I love pea salad! I have never added cheese to mine but this looks yummy. I love bleu cheese! It looks like a great addition. Thanks for sharing! I did not like this salad as a child, but as an adult, I can so appreciate the creamy, salty-smoky, and fresh taste of it. It is a perfect salad for so many different meals. My family has had something similar. I just never knew how to make it. I think bacon and the blue cheese would be a delicious addition. Oh yum! I bet this is so delicious! I can’t wait to make a lot for me and my family! It has never even crossed my mind to make a pea salad, and I love peas! I will have to give it a try! 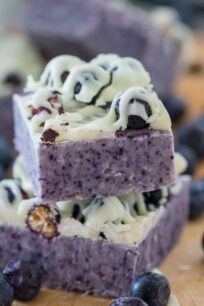 This recipe seriously looks so good. I can’t wait to give it a go! This looks delicious, spring means fresh peas, your pea salad making me carving for some. Next time When I shop I will try to buy some peas. I’ve never heard of pea salad before. It seems like a perfect side dish for a spring meal! My mom used to get this every time we would go to a local tea room. Glad I found a recipe for it now that we have moved away! I love checking new salads out! I can’t wait to try this one! Sooo yummy!